I have been wanting to write on blog for ages about marvelous Millie Johnson – the mistress of the bedchamber here at Governors Estate Eleuthera. One of the great things about writing a blog is the time you get to spend chatting with people – all in the name of research of course ! I learned at a very young age that most people have an extraordinary story tucked away inside them. I was a shampoo girl in a hair salon and loved talking to the ladies while I washed their hair – and was totally hooked on drawing out their stories. Anyway – back to the lovely Millie Johnson – born in Eleuthera in 1949 – she had a sad childhood growing up in Nassau – being passed from one relative to another and came back to Cupid’s Cay in the mid sixties with a small baby. I first met Millie when we moved here in 2004 – I was introduced to her by our mutual friend Pat Rose. Pat had arranged for Millie to come and clean for me at our house here in Governors Harbour – and eleven years later she is still here – still making our bedroom beautiful every week. Dear Millie has glaucoma – she has very , very limited vision – but she is so methodical that the room looks gorgeous every time she finishes it. Bob is the one one who christened her ” Mistress of the Bedchamber” because no-one else quite gets the perfect results that she does…… Sheets are smoothed within and inch of their life , pillows stand to attention and you are torn between wanting to dive into such a beautiful looking bed and keeping it looking perfect ! Anyway back to the story of how Millie finished up being so good at what she does – making beds and making bedrooms look beautiful. Millie worked from 1972 – 75 as a waitress in the elegant French Leave Resort – she was mainly based in the managers dining room where she rapidly learned silver service waiting. Her personality meant that she was always very well liked by her customers and she received plenty of tips. French Leave burned down in the mid seventies so Millie made do with 5 cleaning jobs ! Following her heart in 1984 Millie went to Freeport with her then boyfriend where she worked as a waitress at the Lucayan Beach Resort. Here she had the hotel training as a bartender, a wine steward and in housekeeping and she worked there until 1989. 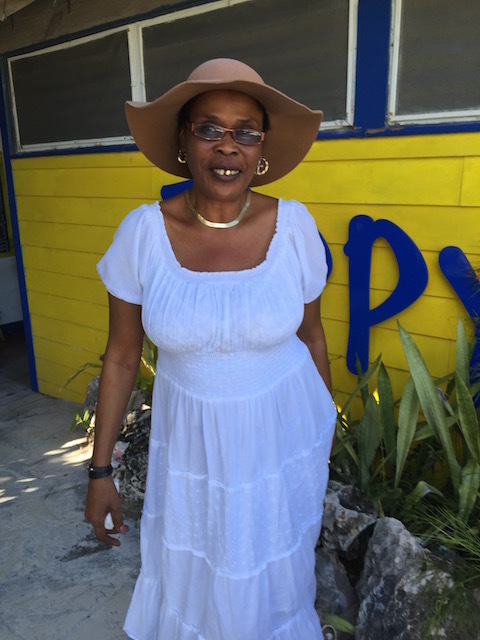 In 1990 Millie returned to Eleuthera and started as a part-time bar worker but she quickly got a permanent job as a room maid. This was where she flourished. Millie clearly had an eye for detail in making the rooms look good – she had 12 to service every day – her bed making skills were honed and perfected here and she was held up as an example of excellence to her fellow maids. She often won employee of the month – maybe I should give her that award again !! Club Med of course closed down in 1999 after Hurricane Floyd and never re-opened The staff were members of the Bahamas Hotel & Catering Allied Workers Union and Workers House was built in 2000 with the union funds. Millie worked there until 2004 when her failing eyesight meant that she could no longer keep up her duties. December 2004 was when she came to work for us – and their loss is definitely our gain. Now all the maids that we have working in our rental houses have to come up to Miss Millie Johnson’s high standards……. Check out this link for some old pictures of Club Med when it was open in Eleuthera …. That is a great story. People like Millie make Eleuthera fascinating. Thank you. Such a pleasure finding all this information out – and so pleased you enjoy it….